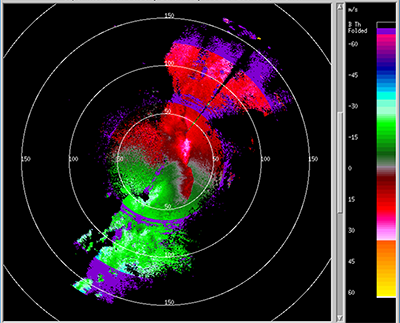 In VCP 112 for split cuts, the MPDA combines velocity data from a high PRF SZ-2 Doppler scan (upper right) with a lower PRF SZ-2 Doppler scan (lower right) to create a velocity product (lower left) with much reduced range folding (purple haze). 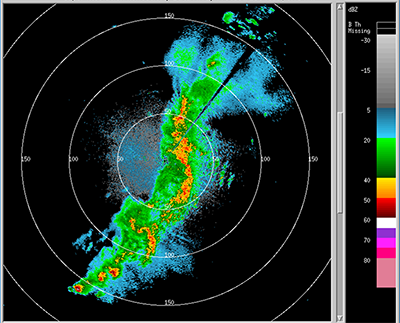 The Reflectivity image (upper left) is shown for reference. The Mid-Volume Rescan of Low-Level Elevations (MRLE) function is based on the proven SAILS concept. However instead of only rescanning the lowest elevation like SAILS, MRLE rescans the lowest “N" elevations (where “N" can either be 1, 2, 3, or 4 elevations). MRLE rescans the elevations in the middle (by time) of the volume scan. 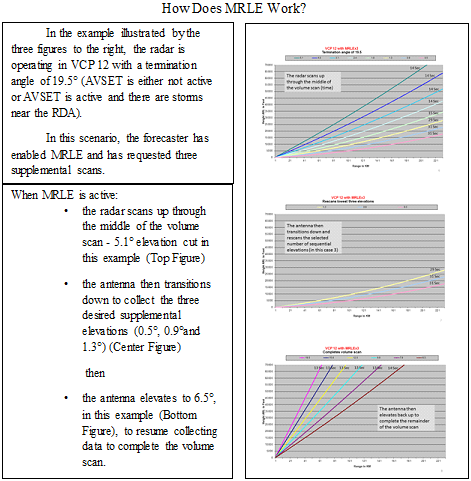 Level II Data – The following Level II data files are provided to exercise with MRLE. 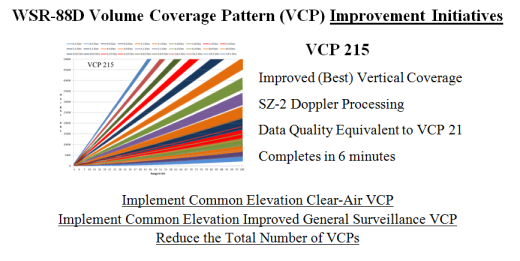 Level II Data – The following Level II data files are provided to exercise VCP 35 and VCP 215. Additional data may be requested from NCEI (formerly NCDC) for ROP4 for 09/29/15 1908UTC through 09/30/15 1258UTC. VCP 35 and VCP 215 were executed during the following time periods. 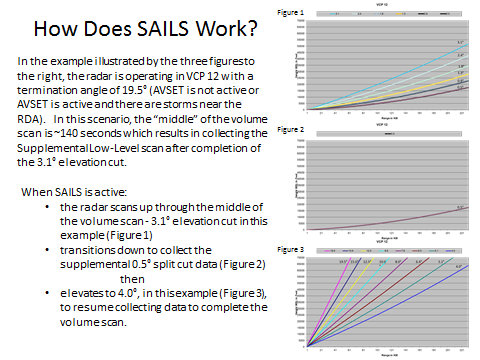 Building on concept of SAILS, the Multiple Elevation Scan Option for SAILS allows the operator to select either one, two or three supplemental low-level elevation scans (verses only one supplemental scan allowed in the initial SAILS implementation) per VCP (ONLY available with VCP 12 and VCP 212). Level II Data – The following Level II data files are provided to exercise systems with all three SAILS options. Dynamic Scanning - VCP duration and product availablilty comparisons underscore the advantages of using AVSET and SAILS during severe weather events. 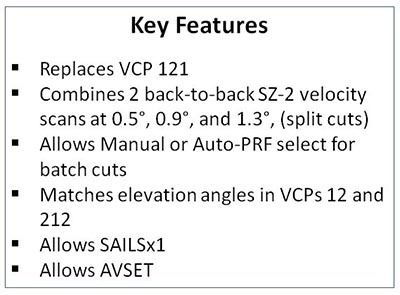 Severe Weather VCP Duration: This table lists the average VCP duration based on AVSET termination angle (VCP 12 and 212 include SAILS). 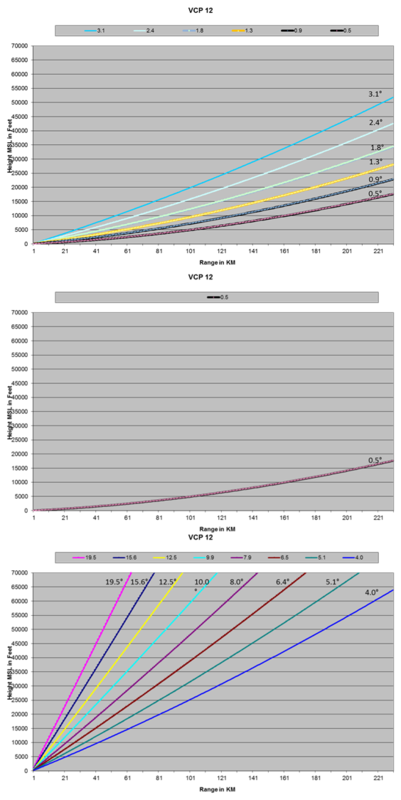 Product Availability Comparison: This table compares the number of products available per hour with and without AVSET and SAILS executing. The Auto PRF algorithm has been in the WSR-88D since the beginning. This algorithm works well but it simply selects the Doppler PRF that results in the least amount of range folded (purple) data for the entire area within a 230 km radius of the radar without consideration for the importance of any individual storm. To address this limitation, the ROC is working on a Storm-Based AUTO PRF function to augment the legacy AUTO PRF algorithm. To accommodate the requirement for SZ-2 to have 64 pulses per radial, the PRFs for all SZ-2 VCPs are hard coded. The hard coded PRFs result in the second trip clutter induced range folding bins to always be at a constant range for each VCP. While in most circumstances this is a manageable issue, under some conditions the inability to change the location of the second trip clutter induced range folded data can have a detrimental impact on the forecast and warning process. 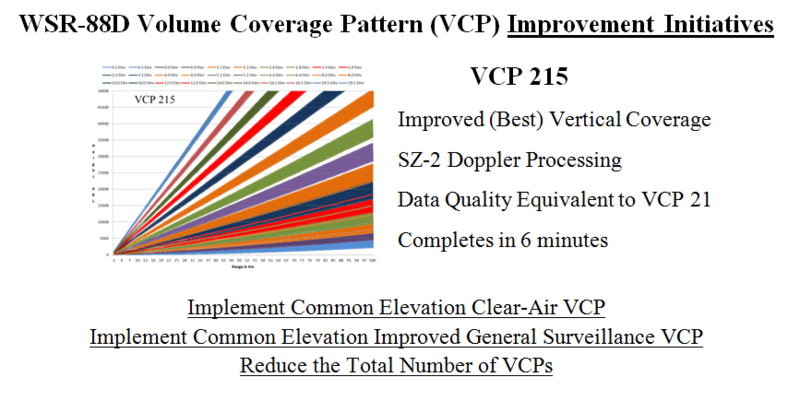 To address this deficiency, the ROC is implementing an automated PRF selection capability for the three SZ-2 VCPs (VCP 212, VCP 211 and VCP 221). This new SZ-2 Auto PRF Function determines the optimum PRF (Storm-Based or Legacy, as selected by the operator) and modifies the antenna rotation rate to maintain the 64 pulses per radial requirement. We are encouraged by early testing of testing the SZ-2 Auto PRF function. Please check back later for more detailed information. A scanning method to reduce the elapsed time between 0.5° elevation scans. SAILS may not be recommended for every radar due to existing bandwidth limitations. 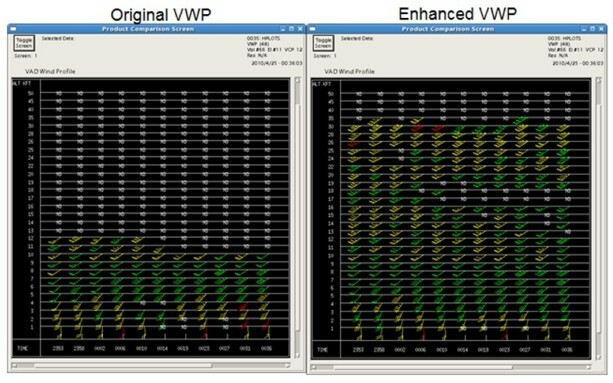 The Enhanced Velocity Azimuth Display Wind Profile (EVWP) function is designed to improve the availability and accuracy of VWP wind estimates. Automated VCP Evaluation and Termination Update 2012. Summary of use of AVSET at Raleigh 11-16-2011 tornado event. Provided by Jonathan Blaes, RAH Science Operations Officer. AVSET will be available for operational use in RPG Build 12.3, scheduled for release in Oct 2011. AVSET will be available as long as your RPG is connected to a pre-Dual Pol RDA. When your WSR-88D RDA is upgraded to RDA Build 12.0 (Dual Pol), AVSET will no longer be available since it is not of the initial Dual Pol software suite at the RDA. AVSET should be restored with RDA/RPG Build 13.0, which is to be the first post-Dual Pol upgrade. AMS 30th Conference on Hurricanes and Tropical Meteorology Presentation (with audio).